Jacob has been working on this project for the last month. He was to record what the moon looked like every day. Well, it's been pretty crappy weather this month, so most days, there was no moon to be seen. So, I printed off a page of what the moon was supposed to look like. 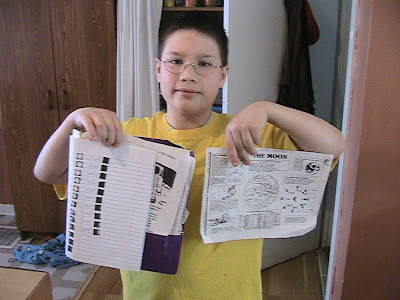 He was so excited to be done with the project, that he wanted me to take a picture and share it with everyone! Good Job Jake! Your moon drawings look awesome! 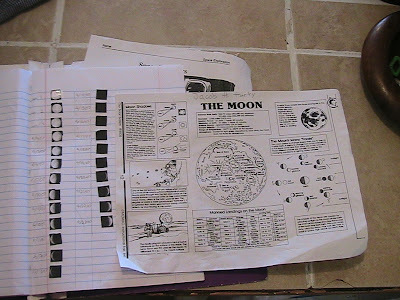 I knew all about moon cycles for a semester of Astronomy. I'm so glad I have taken tons of classes with information I regurgitate for a month. The project looks good Jacob, and glad you're done with it. It's a relief being done with extensive, tedious, projects. I think that he would have enjoyed the project a lot more if the weather had been better. More than 1/2 the month though, he'd go out to look, and it would be overcast. Oh well.